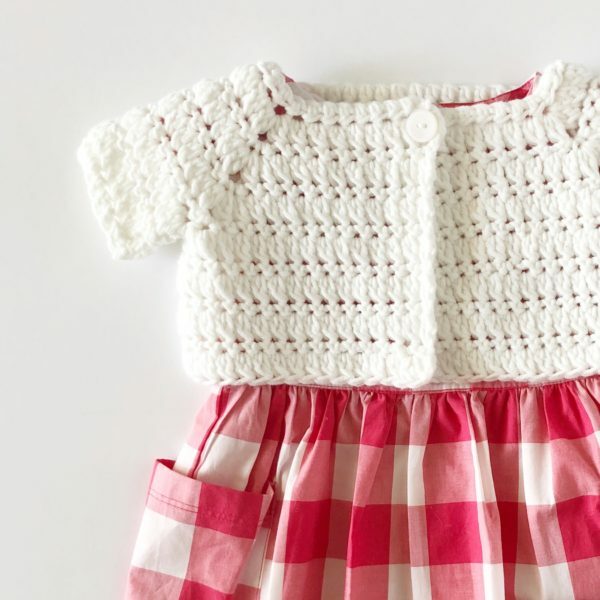 And then the other day, as Haley, Annie and I were out having lunch, which happened to be right next door to a baby clothes store, what was in the window but an adorable gingham dress! A crochet baby sweater shrug must be made for it! I immediately thought to myself. We popped into the store and bought it right away. Last year I was brainstorming around for a new blanket idea and really wanted to make a gingham look blanket. I started with learning how to carry yarn through my work with a checkerboard blanket pattern. Which then eventually led me to use three colors and turning it into gingham check. I’ve loved it ever since and have made eight gingham blankets. All the patterns are here on my site, just click the highlighted words and you can choose which you’d like to make yourself if you happen to love that look too! A DC2TOG is made by combining two DC together into a cluster. Yarn over, (YO) insert your hook into the designated stitch, YO and pull through. YO and pull through the first two loops on your hook and stop. YO and insert your hook into the exact same stitch, YO and pull through. YO and pull through the first two loops again, then YO and pull through all three loops remaining on your hook. The stitch is completed. A single crochet (SC) stitch is made by inserting your hook directly into the designated stitch, YO and pull through, YO and pull through all loops on the hook. A half double crochet (HDC) stitch is made by YO and inserting your hook into the designated stitch, YO and pull through, YO and pull through all loops on the hook. (You can purchase an ad-free version of this PDF from Etsy. Free pattern below). Size 12 month -to 18 month old. Whatever size 4 weight yarn you choose, you’ll need about 200 yards. ROW 2: In the top of the first stitch, work one DC. (This will count as the first cluster along with the CH 2 turning chain.) DC2TOG cluster in the next 7 stitches. In the next stitch work DC2TOG, CH, DC2TOG, DC2TOG next 4 stitches, in the next stitch work DC2TOG, CH, DC2TOG, DC2TOG next 16 stitches, in the next stitch work DC2TOG, CH, DC2TOG, DC2TOG next 4 stitches, in the next stitch work DC2TOG, CH, DC2TOG, DC2TOG in the next 8 stitches, CH 1 and turn. ROW 3: SC in the first stitch and each stitch to the CH space that separates the two DC2TOG clusters. Work 3 SC into the chain space. Continue working a SC in each stitch around always working 3 SC into the CH space of each corner. CH 2 and turn. ROW 4: DC into first stitch, DC2TOG in each SC to the corner. Work DC2TOG, CH, DC2TOG, in the middle SC stitch of each corner. CH 1 and turn. ROW 5: Repeat row 3. Remeber to always work 3 SC into the Chain space in between the clusters on each corner. ROW 6: Repeat row 4. Remember to always work DC2tog, CH, DC2TOG, in the middle SC of each corner. SC in each stitch to the corner. Work one SC into the middle SC of the row below, CH 1, skip over all the SC and find the middle SC of the next corner, work 1 SC into that SC. Continue working SC across the back of your sweater to the next corner SC, SC into the middle SC of the row below, CH 1, skip over all the SC and find the middle SC of the next corner, work 1 SC into that SC, continue working SC to the end of the row, CH 2 and turn. Work the DC2TOG cluster in each SC stitch across, CH 1 and turn. Work SC in each cluster stitch across, CH 2 and turn. Repeat alternating the rows for as many as you need to get the desired length of your shrug. Tie off and weave in all ends. Attach a button and you can be finished right here. Keep reading if you want sleeves. Pull up a loop in the CH space under the arm, and SC. SC2TOG over the next 2 spaces, SC in each stitch around the arm to the last 2 spaces. SC2TOG the last two spaces, join with first SC. CHain 2 and turn. Work a DC into the first space, (just as you have been doing it counts as the first cluster along with the turning chain.) DC2tog cluster in each stitch around, join with a slip stitch to the turning chain. Repeat alternating rows of SC and rows of cluster 2 times, or to the length of sleeve you desire. Please watch this video for more help and ideas about making your sweater larger. Here are pictures of the completed sweater in cotton. Can you tell it’s just a bit lighter looking weight wise? I liked the drape of this cotton better than the loop and thread nylon acrylic blend yarn. Oh I forgot to say to grab any button you have and sew it on one side of the sweater. It should fit right into the first row of clusters. If not, you can also make a loop with several chains to the size you need to fit the button you have on hand. Come and find me on Instagram or Facebook and share a picture of your completed sweater! I hope it’s an easy and fast project for you.